Once you beat all the stages, you can challenge your friends to a match as long as they own the game. The multiplayer uses the same levels as the single player campaign. The game play isn’t much different other than comparing your scores at the end to see who is the master rapper. If you know someone who wants to try the game, you can use game share and send them the first level to play. The graphics are definitely unique with bright colors and flat cookie cutter style animation. The in-game movies are entertaining and give the characters some depth. The game’s animations vary depending on how well you are performing. The characters get agitated and do funny things when you’re rapping poorly. For example, the birthday cake level has you following the instructions from a cooking hen. If you mess up too many times, her face will turn red and she’ll lay an egg. While this game is family friendly, there is some toilet humor. 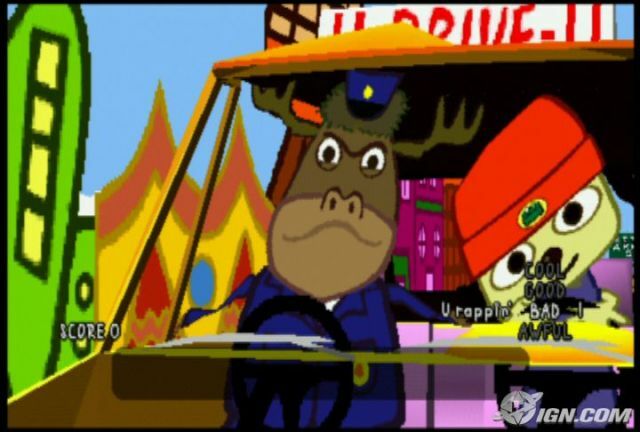 One of the levels involves Parappa making it to the bathroom in time. If you don’t make it, you’ll see his face turn green and a movie clip of rockets going off in his body. 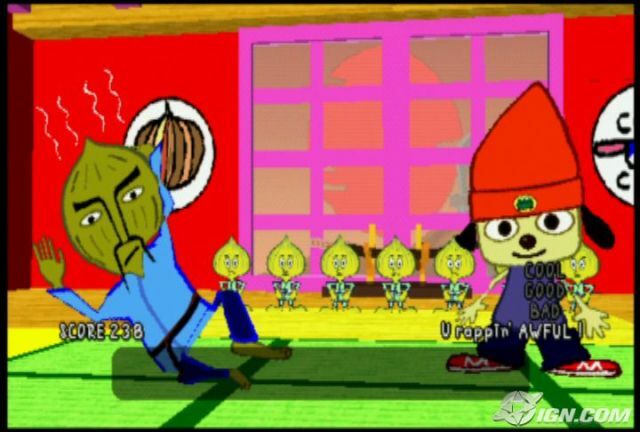 Overall, Parappa the Rapper is a cute but frustrating game. Nailing some of these songs is annoying but rewarding at the same time. If you beat every level with a Cool rating, you get an extra unlockable scene. While the character development and songs are solid, this game’s lack of longevity and a few glitches make me glad I didn’t buy this game new. If you haven’t played this game, I would recommend getting it used or on gamefly.